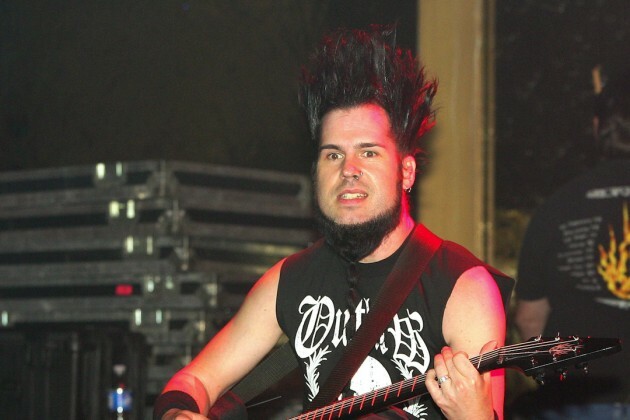 Back in November of 2014, the world lost Industrial/Nu Metal titan Wayne Static who was known as the King of Evil Disco. Wayne was know for having that iconic hair style very reminiscent of Legion of the X-Men. He was also known for his unique vocal delivery style that was infectious to try and imitate. I don’t know why I haven’t covered a single album, but there is a reason I chose the one I did. I could have chosen Wisconsin Death Trip as this week’s album, but Machine was the very first Static-X album that I purchased myself. The album was released on May 22, 2001 and it was produced by Ulrich Wild. The band was made up of Wayne Static (Lead Vocals/Guitars), Tony Campos (Bass), Ken Jay (Drums), Tripp Eisen (Lead Guitar, but never recorded a note for the record), and Koichi Fukuda (Keyboards/Programming). The album was a huge success for the band as it peaked at number 11 on the Billboard Top 200 charts making it the highest charted album for the band (Cult Of Static was the second highest). My Final Thoughts– This is definitely one of my favorite releases from the band that showed that no sophomore slump existed for them. The album also saw them venture out a little more musically than in the previous album as well. My favorite track on the album is definitely Cold followed by Black And White. My least favorite track on the album would probably be the title track, but that isn’t me condemning the song either. Anyways, I am going to give the album 4.4 stars out of five for a final grade. Matt Pike, the High On Fire singer/guitarist has gotten himself into the news lately when he sat down for an interview recently with The Void. In the interview, he has some insight into Dave Mustaine and how Metallica would never be Metallica without him saying, “He was an innovative f–king guy for that era. I don’t think Metallica would sound like Metallica without Dave Mustaine. I don’t think a lot of people would be doing ‘jugga-juggas’ if Dave Mustaine hadn’t set that Metallica thing up. I can tell by his playing. I know the songs that Dave f–king wrote in that band, and then you see him and what he does now. And, you know, there’s certain albums that I like better than others, but probably because I was a kid when So Far, So Good… So What! came along. And then nowadays, when I hear it, I’m an older man… It’s still great, but it’s not the one that I had the lust over when I was a metal kid. I never thought I’d be sitting in a room with Dave Mustaine at any given moment in my life.” To read the rest of the interview, go here. I am deeply saddened to learn of the passing of my good friend and brother-in-music, Keith Emerson. Keith was a gentle soul whose love for music and passion for his performance as a keyboard player will remain unmatched for many years to come. He was a pioneer and an innovator whose musical genius touched all of us in the worlds of rock, classical and jazz. I will always remember his warm smile, good sense of humour, compelling showmanship, and dedication to his musical craft. I am very lucky to have known him and to have made the music we did, together. Rest in peace, Keith. Ed Force One was this morning tethered to a tow truck to be taken for refueling prior to flying over the Andes to Cordoba for the next show. On moving the steering pin that is part of the mechanism that connects the ground tug to the aircraft seemingly fell out. On making a turn the aircraft had no steering and collided with the ground tug badly damaging the undercarriage, two of the aircrafts engines and injuring two ground tug operators, both of whom have been taken to hospital. We hope of course that they make a full and speedy recovery and we will be closely monitoring their progress. The flight engineers are on site and evaluating the damage, but their initial report is that the engines have suffered large damage and will require an extended period of maintenance and possibly two new engines. We are currently making contingency arrangements to get to the show in Cordoba tomorrow with band, crew and equipment intact. Fortunately the 20 tons of equipment had not been loaded onto EF1 at the time of the accident. Although this is tragic for our beautiful plane we do not expect this to affect our concert schedule including the next 2 shows in Cordoba and Buenos Aires. And we hope to find a new Ed Force One to continue this adventure with us in the near future. We will keep everyone updated when we know more, so keep checking only on this site for official news. To finish on a high note however, our visit to Chile was a huge success with 58,000 fans coming to the show as totally brilliant as ever in the Stadium Nacional last night. We love you guys!